Ceramic tiles are one of the most popular tiles and they are used in building and construction activities all over the globe. Ceramic tiles is a key building material used in the construction industry. Ceramic tiles are stylish, durable, and versatile. They play an integral part in the décor of any space. Ceramic tiles are manufactured from various minerals and clays such as feldspar, zircon, bentonite, kaolin, and clay. Raw materials undergo various mechanical operations such as mixing, drying, and forming to yield the ceramic tile body. The tile body is further heated at elevated temperatures in order to improve the tile porosity. Thus, resilient ceramic tiles are produced. Ceramic tiles is one of the key components used in the construction industry for building interior and exterior floors, footpaths, swimming pools, walls, partitions, and roofs. Ceramic tiles are highly durable. They offer protection from abrasion and stains and they require less maintenance. Additionally, these tiles are available in a wide range of sizes as well as colors. They are available at affordable prices. Ceramic tiles are extensively employed in various concrete structures ranging from residential houses such as flats, apartments, villas, and bungalows to commercial complexes such as hospitals, educational institutions, and airports. Furthermore, these tiles are used in the construction of industrial concrete structures such as food processing factories and warehouses. Based on product, the ceramic tiles market has been segmented into the floor tiles, wall tiles, and others. The others segment include ceiling tiles, roofing tiles, and countertop tiles. Floor tiles are consumed the most, followed by wall tiles. Ceramic floor tiles are manufactured from earthenware and porcelain. They are manufactured from clay, which is shaped, dried, and fired in a kiln at a very high temperature. Ceramic floor tiles are commonly used in shower and toilet flooring, due to their ability to resist stains, odors, allergens, or bacteria. Ceramic wall tiles are used in bathrooms, bedrooms, kitchens, living rooms, and exterior wall cladding. They are also employed for outdoor applications. Ceramic ceiling tiles are used to offer attractive ceiling surfaces. These can be installed considering the interior space. Apart from insulation, ceramic ceiling tiles have anti-corrosion properties. They are thermally efficient and fire-resistant. Roofing tiles are largely used in flat-roof houses. These tiles protect houses from scorching summer heat and keep houses cool from the inside. In terms of application, the ceramic tiles market has been segmented into residential replacement, commercial, new residential, and industrial. Ceramic tiles are highly used in residential replacement activities worldwide. Hence, the residential replacement segment is projected to dominate the global ceramic tiles market during the forecast period. Increase in new residential activities is estimated to drive the demand for ceramic tiles in the new residential segment in the near future. The commercial segment (that includes offices and sports complexes) is anticipated to expand significantly during the forecast period, due to upcoming projects in the global building & construction industry. In terms of volume, Asia Pacific dominated the global ceramic tiles market in 2017. The market in Asia Pacific is anticipated to register a rapid growth rate during the forecast period. Low manufacturing cost, increasing disposable incomes, and rising construction activities in Asia Pacific are likely to drive the market in the region from 2018 and 2026. China held a leading share of the market in the region in 2017, owing to presence of promising construction industry in the country. China, India, Vietnam, and Indonesia are key countries of the ceramic tiles market in Asia Pacific. Asia Pacific is followed by Europe. Turkey is a key country of the market in Europe. Spain, Italy, and Turkey are major countries in Europe engaged in the manufacture of ceramic tiles. They hold significant shares of the market in the region. Increasing construction activities and rising exports are factors responsible for high production of ceramic tiles in Europe. The market in Latin America and Middle East & Africa is projected to witness significant growth during the forecast period. The North America market is anticipated to witness steady growth between 2018 and 2026. Currently, recovery of the building & construction industry in the region, especially in the commercial sub-segment, is a key factor driving the ceramic tiles market in North America. Major manufacturers of ceramic tiles across the world include Mohawk Industries, Inc., Siam Cement Group, Ras Al Khaimah (RAK) Ceramics, Grupo Lamosa, Kajaria Ceramics, China Ceramics Co. Ltd., LASSELSBERGER GmbH, Panariagroup Industrie Ceramiche S.p.A., Gruppo Concorde S.p.A., Johnson Tiles, and Kale Group. Ceramic tiles have quickly become one of the most popular types of materials used in building and construction activities. Ceramic tiles are made of sand, natural products, or clays. Once molded into shape, ceramic tiles are fired in a kiln. Ceramic tiles can be either glazed or unglazed, but a majority of homeowners prefer glazed tiles. With their increasing popularity, ceramic tiles are becoming available in hundreds of different designs. Rapid growth of the building & construction industry in Asia Pacific is a key driver of the global ceramic tiles market. Rise in population and increase in disposable incomes are some of the major socio-economic factors responsible for growth of the building & construction industry in Asia Pacific. This, in turn, is expected to drive the demand for ceramic tiles in the region in the near future. Residential replacement, commercial, and new residential are major application segments of the global ceramic tiles market. Floor tiles and wall tiles are major product segments of the global ceramic tiles market. The others segment comprises countertop tiles, roofing tiles, and ceiling tiles. In terms of demand, the floor tiles segment accounted for a leading i.e. more than 50% share of the market in 2017. Furthermore, this segment is expected to witness rapid growth during the forecast period, owing to the rising usage of floor tiles in the construction of new residential buildings in developing countries. Application segments of the ceramic tiles market are residential replacement, commercial, new residential, and industrial. The residential replacement segment constituted a major share of the global ceramic tiles market in 2017, due to recovery of the construction industry in developed countries such as the U.S. In terms of application, the global ceramic tiles market has been divided into residential replacement, commercial, new residential, and industrial. Residential replacement was a highly attractive segment of the market in 2017. This trend is expected to continue during the forecast period. The shift toward use of highly durable and eco-friendly tiles is estimated to propel the global ceramic tiles market in the near future. Increase in residential and commercial construction activities across the world is also projected to boost the demand for ceramic tiles in the next few years. Rise in the demand for ceramic tiles for use in commercial applications, especially for the construction of offices, hospitals, etc. is also likely to augment the market during the forecast period. Ceramic tiles are strong, easy to maintain, and cost effective. This makes them a preferable choice over other types of flooring such as vinyl and wood. Ceramic tiles are available in a wide variety of shapes, colors, sizes, and designs. Based on region, the global ceramic tiles market has been segregated into North America, Europe, Asia Pacific, Latin America, and Middle East & Africa. In terms of demand, Asia Pacific was the leading region of the global ceramic tiles market in 2017. Significant rise in building and construction activities in Asia Pacific is a key factor driving the demand for ceramic tiles in the region. The report analyzes and forecasts the market for ceramic tiles at the global and regional levels. The market has been projected in terms of volume (million square meters) and revenue (US$ Mn) from 2018 to 2026. 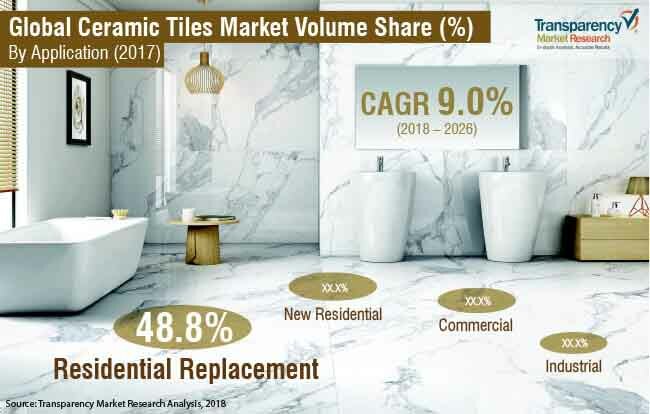 The study includes drivers and restraints of the global ceramic tiles market. It also covers the anticipated impact of these drivers and restraints on the demand for ceramic tiles during the forecast period. The report also highlights opportunities for growth of the ceramic tiles market at the global and regional levels. The report comprises detailed value chain analysis, which provides a comprehensive view of the global ceramic tiles market. Porter’s five forces model has also been included to help understand the competition landscape of the ceramic tiles market. The study encompasses market attractiveness analysis, wherein product and application segments have been benchmarked based on their market value, growth rate, and general attractiveness. The study provides a decisive view of the global ceramic tiles market by segmenting it in terms of product, application, and region. These segments have been analyzed based on the present and future trends. Regional segmentation includes the current and forecast demand for ceramic tiles in North America, Europe, Asia Pacific, Latin America, and Middle East & Africa. The report also covers individual product and application segments of the market in every region. The study includes profiles of major companies operating in the global ceramic tiles market. Key players profiled in the report are Mohawk Industries, Inc., Siam Cement Group, Ras Al Khaimah (RAK) Ceramics, Grupo Lamosa, Kajaria Ceramics, China Ceramics Co. Ltd., LASSELSBERGER GmbH, Panariagroup Industrie Ceramiche S.p.A., Gruppo Concorde S.p.A., Johnson Tiles, and Kale Group. Market players have been profiled in terms of attributes such as company overview, business strategies, recent developments, and SWOT analysis. The report provides the estimated market size of the global ceramic tiles market for 2018 and forecast for the next eight years. Market numbers have been estimated based on product, application, and regional segments. Market size and forecast for each product and application segment have been provided for the global and regional markets.